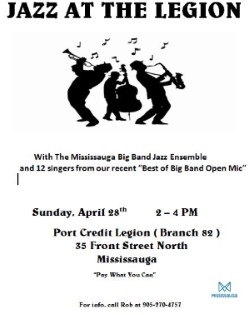 Port Credit Legion - Branch 82. Come out and be part of a LIVE RECORDING SESSION with the band and 12 exciting singers from our Open Mic Event!! Two Sessions: 11am-1pm and 2pm-4pm. Free if you clap LOUD. Check out the poster.